Testing, testing, testing. I shall be glad when this week is OVER. But, I have to say that I am also a little excited. I have seen so much growth in my students this year, and I am so proud of them. My kiddos start their state testing tomorrow. I know they are going to do fabulous. I can feel it, and I know that they can, too. I read somewhere(no idea where...drat!) 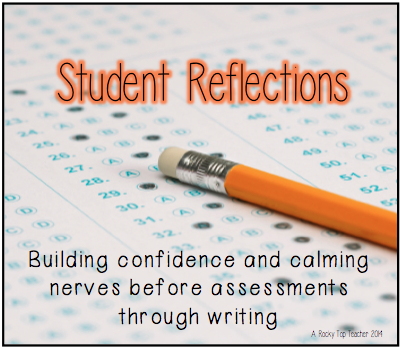 that one way to help students de-stress before a test is to give them the opportunity to write out their feelings. On Friday, I gave each student an index card and asked them to complete the following sentence stem for me. I told them that they didn't have to write their name and to be completely honest with their responses. "I am going to __________ on the SAT10 because _________." I used this as our ticket out the door to specials and read them while they were gone. To be honest, I was not prepared for the whirlwind of emotions that I experienced while reading my students' cards. Here are some of the responses I got! "I believe I am going to rock on the SAT10 because I studied." "I believe that I am going to do awesome on my SAT10 because I know that I am smart." "I believe that I am going to do awesome on my SAT10 because we have learned a lot of things in second grade and I think I am going to rock the test." "I believe I am going to rock the test because I know I am awesome." A personal favorite-this little guy has a great sense of "dry" humor for a second grader! "I believe that I am going to sit on the SAT10 because that is what it told me to do." But, I also got a few that were not as positive. "I believe that I am going to maybe do bad because the test is going to be hard." "I believe that I am going to do wonderful and bad because I am sometimes smart and sometimes not." The exercise opened my eyes to a few things. I realized that many students DID believe in themselves which is what I have been pushing for all year. I also realized that some of my students were still feeling a little apprehensive. Can we really blame them? Not really. But, there is NO way that I was going to let them continue to feel nervous about the test. So, the kiddos sat down in a circle, and I read the cards to the class anonymously. When we came to the funny ones; we all laughed. When I read the ones about students believing in themselves; I may have cried. And, when I read the ones that voiced concerns, I asked my class to take a moment and say some things to the group that would make those students who were nervous feel better. I heard comments like "You will be great! ", "You can do it! ', "I believe in you! ", and "Ms. Young loves you so it's okay!". That my teacher friends is worth its weight in gold. Model how to be positive, encouraging, and confident. Hold them accountable for their learning. And, never underestimate the mind and will power of a child.